Recent release “Apples from the Garden of Eden” from Page Publishing author Rocco Scibetta is both enlightening and though provoking; this work tells a story of love, fate and forgiveness. 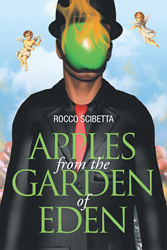 Rocco Scibetta, a contemporary artist, fine arts enthusiast, devoted writer and author, has completed his new book “Apples from the Garden of Eden”: a gripping and potent work that keeps the reader guessing through the twists and turns of a unique love story. Published by New York City-based Page Publishing, Rocco Scibetta’s emotional tale portrays the beauty of life, love and self-acceptance. Felix X. Cole is a brilliant madman who dared to dream. A man of his time living in a society that might have outgrown itself. This is a satire about crumbling morals and fragile denizens in a throwaway culture saturated with adolescent wisdom who never gets it right the first time. A surreal throw down between Rockwellian depiction and the disenchanted persons on the street. "Apples from the garden of Eden" is a thought provoking story that raises the question. If a person were given a second chance to fall in love again after what it cost them the first time... could they beat the odds? Even Adam should get a second chance. Readers who wish to experience this profound work can purchase“Apples from the Garden of Eden” at bookstores everywhere, or online at the Apple iTunes store, Amazon, Google Play or Barnes and Noble.